Georgian Metrology Institute is a structural unit of Legal Entity of Public Law – Georgian National Agency for Standards and Metrology (GEOSTM), which is in the system of the Georgian Ministry of Economy and Sustainable Development. Legal basis for providing uniformity of measurement in the country is Product Safety and Free Movement Code, which includes laws “About Provision Uniformity of Measurements”, and also other laws related to Quality Infrastructure. · and other kinds of activities. · recognition of initial verification, etc. 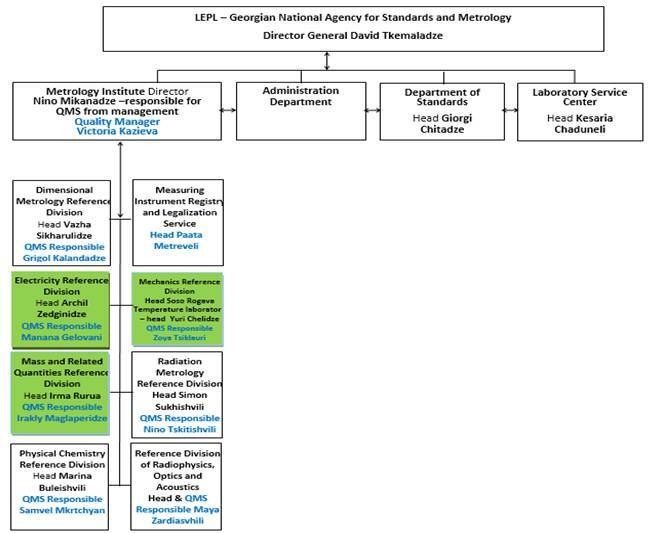 GEOSTM MI Divisions also conducts works on maintenance and support for measurement standards, including national state measurement standards of Georgia. The Metrology Institute is internationally recognized for its calibration and measurement capabilities as a results of peer-review, conducted in October, 2013 for the fields of mass, electrical measurements and temperature. In February, 2014 at the meeting of the Technical Committee of COOMET Quality Forum the MI received relevant recognition certificate QSF-R32. For 100% factor of availability of public information for the year 2014 (similarly like in 2012-2013) GEOSTM was awarded a certificate by the Institute for Development of Freedom of Information (IDFI). Georgian National Agency for Standards and Metrology (GEOSTM).